I have worn Justin work boots for 20 years. 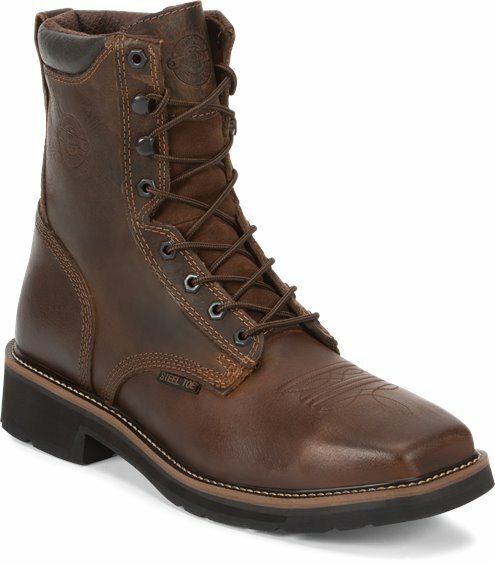 This boot looks great but make my feet sweat like no other boot, no matter what type of sock I wear. These boots have a mesh/foam backed liner that does’nt breath. I work in the movie Industry in Los Angeles, CA. These are the perfect boots for this industry. Lightweight but still does the job when working 12-14 hr days. This is my 3rd pair of these squared toed beauties. I've owned several brands and types of workboots, and this pair takes the cake. I prefer pull-on boots but my employer implemented a lace up policy, so I picked these up. Easiest break-in period, they were relatively comfortable the entire time, and once I broke them in as-is, I added a custom insole and I could live in these things if I didn't have to remove them to dry out the moisture from the frequently wet environment I work in. Unless Justin recommends a better replacement for these or I get to swap back to pull-on boots, I'll be a faithful wearer of these. My picky feet are very happy in them on a daily basis for 16+ hours. I just bought a pair of these for work and they are my new favorite boots. 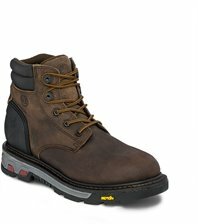 I'm a forester and I can say these boots are great for working in the woods and on logging jobs. And they broke in very quickly. I will definitely be buying another pair in the future. I have worn these for approximately 2 years while at work and also at home. Takes some time to break in but these have held up very nicely. These only recently started giving me fits, I will be purchasing the exact same pair to replace them. Bought these a year ago, GREAT fit and comfort. I'm on my feet on the site for 12+ hrs a day 6 days a week and zero foot issues. 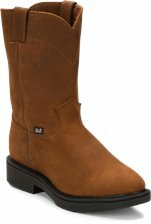 I would recommend these boots to anyone! Bought these a year ago. still in very good condition. wear them every day, reason for 4 stars is because they take a while to break in. I spent 6 months with these boots on a river barge rain and snow, and another six months welding all over steel in all elements. They finally gave out at about the 14 month mark. I weigh 265lbs and I buy a new pair every year I wont buy another work boot. Also recommend if on your feet a lot and hard on your boots buy a half size bigger so when feet swell when working you will be comfortable all day!!! Have never had sore feet with these!!! only reason I am writing a comment is because im back buying my 3rd set! I bought these boots off amazon several years ago and I absolutely love them. They have lasted through thick and thin. These boots are definitely worth. I was disappointing that these boots aren't actually made in America, but the quality was the same.